There are 14 new Grocery offers from SavingStar available from today. 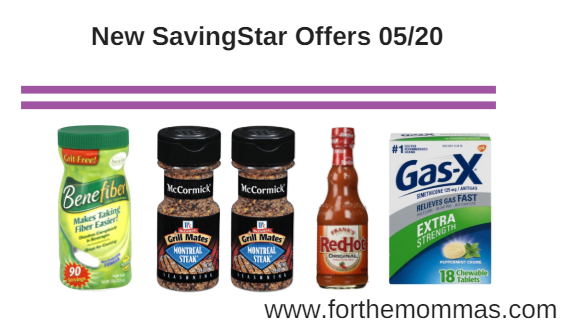 You can save on Purex, McCormick, Nature’s Bounty, all, Benefiber, Frank’s and more. Save $1.00 on any ONE (1) ex-lax® or Perdiem® product..Expires 6/3/2018.Save $1.00. Save $1.00 on any ONE (1) all® product. (Excludes trial size. ).Expires 6/2/2018.Save $1.00. Save 50¢ on any ONE (1) Purex® Liquid or Powder Detergent (any size)..Expires 5/27/2018.Save $0.50. Save 75¢ on any ONE (1) McCormick® Grill Mates® 14oz Sausage or Beef Frank (any flavor)..Expires 9/30/2018.Save $0.75. Save 60¢ on any TWO (2) THE BEST BAR EVER™..Expires 7/20/2018.Save $0.60. Save $2.00 on any ONE (1) Nexium® 24HR Product..Expires 7/15/2018.Save $2.00. Save $2.00 on ANY ONE (1) NATURE’S BOUNTY® OPTIMAL SOLUTIONS® vitamin or supplement..Expires 7/7/2018.Save $2.00. Save $1.25 on any THREE (3) McCormick® Grill Mates® Bottle Blends, Lawry’s® Bottle Blends, or Stubb’s® BBQ Sauces..Expires 6/24/2018.Save $1.25. Save $1.25 on any THREE (3) Frank’s® RedHot® Sauces (12oz or larger), French’s® Mustards (20oz or larger) or French’s® Crispy Fried Veggies (5oz or larger)..Expires 6/24/2018.Save $1.25. Save $2.00 on any ONE (1) Benefiber® product..Expires 6/16/2018.Save $2.00. Save $3.00 on any ONE (1) Citrucel® product..Expires 6/16/2018.Save $3.00. Save $2.00 on any ONE (1) göt2b® styling product (excluding travel and trial sizes)..Expires 6/10/2018.Save $2.00. Save $2.00 on any ONE (1) Persil® ProClean® Laundry Detergent. (Excludes 6 Loads or Less Trial/Travel Sizes. ).Expires 6/9/2018.Save $2.00. Save $1.00 on any ONE (1) Gas-X® 18 ct. or larger..Expires 6/3/2018.Save $1.00.